Ole Gunnar Solskjaer suffered his first Premier League defeat since being appointed Manchester United's interim manager as Arsenal leapfrogged their opponents to move into the top four. Arsenal keeper Bernd Leno also produced two crucial saves to keep out Lukaku, before Pierre-Emerick Aubameyang doubled the hosts' lead from the penalty spot after Fred's foul on Alexandre Lacazette. Soon after Arsenal's second goal, a fan ran on to the pitch and shoved United defender Chris Smalling before being removed by stewards. The Gunners have won seven out of 10 top-flight games in 2019 and are one point behind north London rivals Tottenham, who sit third in the table, with eight games remaining. United, who started the weekend in fourth, drop to fifth in the race for a Champions League spot next season. "Tottenham Hotspur, we're coming for you" chants filled Emirates Stadium at the final whistle as Arsenal fans celebrated a crucial win. Last weekend, Aubameyang left Wembley dejected after his last-minute penalty was saved by Spurs keeper Hugo Lloris to deny Arsenal victory in the North London derby. Against United, he stepped forward and beat De Gea from the spot to seal a first victory over United in six league and cup meetings. It was awarded after Fred's forearm nudged into Lacazette, sending the French forward tumbling inside the box. Lacazette inspired one of Arsenal's finest days under Unai Emery's command. The Gunners were sharp, lively and industrious as they made amends after United eliminated them from the FA Cup six weeks ago. Emery named six players who started Thursday's Europa League defeat by Rennes in his starting line-up, but there was little sign of fatigue as the hosts came flying out of traps. 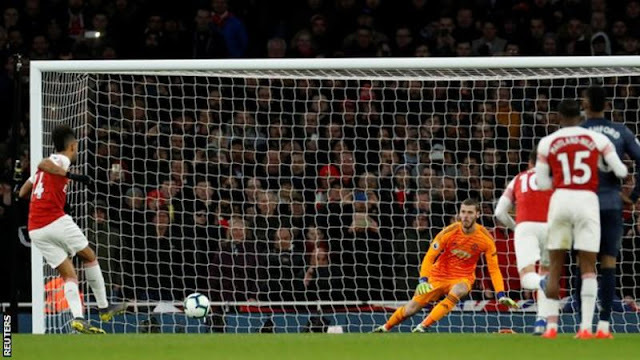 They opened the scoring with their only shot on target in the first half, Xhaka deceiving De Gea with a shot that left the United keeper rooted to his line. Leno was also key for Gunners. The German did well to frustrate Lukaku as the Belgium forward threatened to go around and equalise, before denying the same player with an outstretched leg after half-time. Arsenal have now played all their Champions League chasing rivals - a place in Europe's most prestigious competition next season is very much in their own hands. United have got used to winning under Solskjaer and it will be interesting to see how they respond to a first domestic setback under the Norwegian. After their incredible midweek exploits against Paris St-Germain, they started slowly - although Lukaku will wonder how he did not score from United's first serious attack. The visitors paid the price when they conceded their earliest league goal under Solskjaer and, despite creating chances, were not clinical enough in the final third. Paul Pogba was disappointing on his return to the side but he was by no means United's only player who struggled to reach their recent heights. This was only United's second defeat in 18 league and cup games under Solskjaer. A place in the top four remains in their sight, although they will need to produce an immediate reaction when they return to league action after the international break.